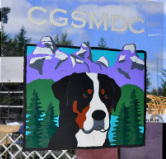 The Cascade Greater Swiss Mountain Dog club was founded in 1998 and is recognized as a regional club by the Greater Swiss Mountain Dog Club of America. The club was established for swissy owners in the Greater Seattle, Washington area, however, we have several members throughout the state of Washington and Oregon and across the country. Our membership includes people who are involved in showing, working events, breeding, breed education and social events with their Greater Swiss Mountain Dog. Please take a look around to learn more about club. We welcome new memberships. Our Board of Directors is always available for any questions you may have.